People of all ages and from many walks of life can benefit from interacting with horses. Read some of our client testimonials below. I first came to Sierrah Acres for my daughter Emily. She struggles with several disabilities and I wanted to find something that would help build her confidence and self esteem. Upon arriving at Sierrah Acres for our meet and greet, I felt an immediate sense of calm. I could see that Emily felt this same way too. The environment was so peaceful. Emily became a client and I could immediately see positive changes in her after the first session. One particular session that comes to mind was when Emily was blind folded during a session leading a 1200 lb horse through an obstacle course relying on the direction of her peers. That alone takes a lot of trust and confidence. This was huge for Emily as she struggles with many challenges, so trusting her peers in that session was so powerful to witness. Emily smiled from ear to ear. Such a proud moment for both of us. One of many great things about Sierrah Acres is that the programming is tailored to the clients specific needs. This is no cookie cutter organization. I do believe Sierrah Acres stands out above all. I would highly recommend Sierrah Acres as I have witnessed first hand how it has made so many positive changes for Emily and myself as a parent. I just wanted to thank you and your team very much for giving John Paul a new and fantastic experience. I'm so proud of him having the courage to pet, groom and ride one of your horses, most importantly he is super pleased with himself! Thanks again for allowing him the opportunity to build and develop some confidence around animals. I can't say enough about what you do! All my kids come back with such confidence and so much love for the horses. They are more grounded and comfortable in their own skins after your program. They shine, and their hurts are less raw. The art component was genius, too. My son was very private about his painting, and wouldn't show it to me at first, never showed it to his sibs, but was so proud of it! "I just wanted to take a moment to express our sincere appreciation for providing our daughter with one of her best weeks over the summer. 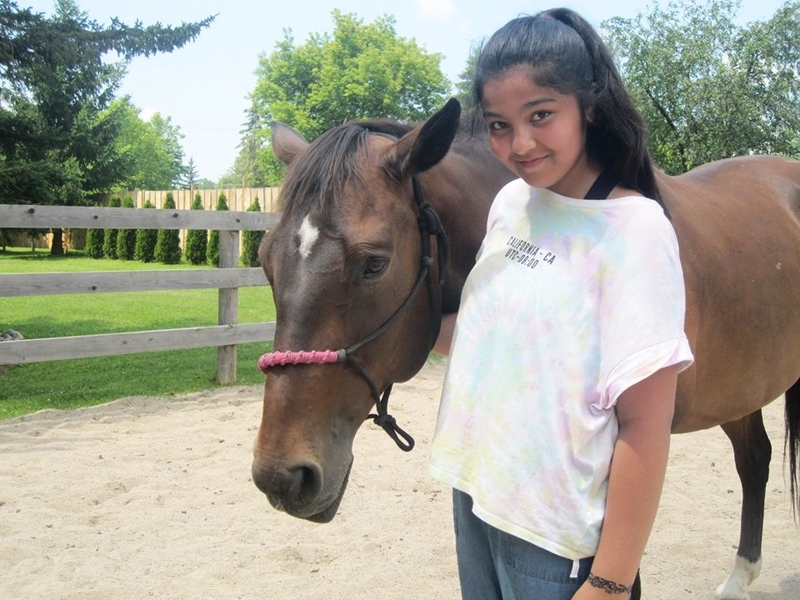 She loved the barn, working with the horses and getting to know their personalities and enjoying being outside, meeting the other kids and of course the staff and volunteers. Cindy, you have a wonderful program and we look forward to signing up again for next year. Thank you so much for sharing the photos with us. She had a story to tell behind every picture. Thank you so much for this positive, interactive, educational and esteem-building experience for our daughter. "The time, effort, experience, knowledge and care that Cindy puts into planning her programs is outstanding. My daughter loves the opportunity to work with the horses, outside in the "real classroom". All the while developing her self-awareness, self-confidence, responsibility and boundary setting skills and so much more. It is so rewarding seeing my daughter thrive." "You and the beautiful Sierrah acres have changed my life. You have given me joy and something to look forward to every day! Thank you for the memories and happiness. I love every second of being at Sierrah acres and it has become a safe space for me. Thank you so incredibly much. You are my hero and my role model!" "My daughter attended Sierrah Acres for a week of youth camp in August 2016. I found out about Cindy’s wonderful camp through a brochure that was in my daughter’s therapist’s office. My 11-year old daughter has issues with low self-esteem and anxiety. What a wonderful experience this camp was for her. I cannot express enough what a positive experience this was for my daughter. She gained emotional strength and confidence through learning that other children also have challenges and fears, and in helping not only herself but others to achieve their goals. I have asked Cindy to let me know of any and all activities and camps that my daughter can attend. She had a wonderful time at the camp, talks about it non-stop and asks when she can go back! I wholeheartedly recommend Sierrah Acres and please feel free to use my name and give my email to anyone wanting a reference for the amazing work that you do – I can’t thank you enough and look forward to future activities for my daughter!" "I just wanted to say thank you for an amazing week of camp. My daughter thoroughly enjoyed every moment. The gift you and the horses gave her is priceless. In the weeks leading up to camp, we were at Sick Kids seeing specialists and she was going to be facing new treatment. She was focused on Sierrah and how much fun she was going to have at horse camp. When she did her MRI, again she spoke of Sierrah and spent most of the time telling me about her and horses. I've even fallen in love with Sierrah too. She is so friendly. There is a peaceful warmth in her soul. You've also given my daughter the gift of self confidence. That is priceless. I still can't believe she can walk around and lead a horse like that. I can't wait to see what she will do in the future. The world is her oyster." "I can't say enough about the owner and operator, Cindy. She is an amazing, caring, wonderful person that has a true passion for helping individuals that are hurting no matter what the cause. I never realized how therapeutic horses could be until I took my daughter to Sierrah Acres for a few sessions. Because of her love for animals I thought it would be good for her. You see, she was only 14 but was bullied as a child, so her confidence was very low and she was becoming very introverted. After only a few sessions at Sierrah Acres, my daughter began to open up, gain confidence and for the first time in a long time, I saw her smile. I hadn't seen her that happy or peaceful in a long time. It was the beginning of better times for her and, because of her visits at Sierrah Acres, she is now happier and more confident. I would recommend Sierrah Acres to anyone and encourage all especially parents whose kids are going through difficulties to try this therapy with horses - no matter what issues they might be facing. I am so grateful to Cindy for all her help and passion that she has poured into Sierrah Acres and I am truly grateful." "The two of us have never had such a positive experience and time with our grandson. We have never ever seen him so engaged and so happy, in an environment that you have mastered and created. Honestly. We told our daughter and son-in-law too. The time and caring you showered on Aiden will be with him and us forever. I make scrapbook albums for all my kids (and now only the grandkids), which they love. These photos will be in his album forever! Thank you again for the most superbly therapeutic day for all of us. It was absolutely brilliant." “I want to thank Cindy for introducing me to the wonder full world of horses. When I first met Sierrah, there was an instant connection and it made me realize that I could have these feelings again. Having someone like Cindy teaching me was amazing; she is a very patient, understanding and caring person. Working with Sierrah and Paris has truly been an awesome experience. Having the horse act as a mirror for my emotions has helped to start to calm my anxiety by forcing me to look at what's going on in myself right at that moment. I have also learned to understand patience a whole lot better and to be comfortable with the pace of my recovery.